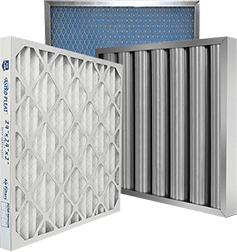 Standard Pleated Filters – Seasonal Furnace & AC Filters | Air Filters, Inc.
Air Filters Incorporated’s Astro-Pleat pleated filters are manufactured using a MERV 8, 11, or 13 rated filter media that effectively reduces and traps pollen, mold, dust, pet dander and dust mites from circulating throughout your home or business. Using a standard pleated filter to capture common airborne contaminates can help alleviate allergies and sinus irritations that can cause watery eyes, itchy throat, coughing and sneezing. 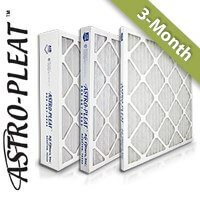 Additional benefits from using the Astro-Pleat seasonal air filter include extending the life of your air conditioning/ furnace system by removing dirt and dust so the HVAC unit isn’t strained from air flow restriction. Made with premium synthetic fiber media that has a high dust holding capacity and filtering efficiency. The synthetic filter media is reinforced with expanded metal backing to prevent media from sagging during use. Astro-Pleat’s frame uses a die cut made from heavy duty beverage board to insure filter integrity in high moisture applications. The filter media is internally glued to the filter frame to prevent contaminates from bypassing the media and recirculating in the air. The filter media is electrostatically charged to effectively capture and hold dust, dirt, pollen, and other common airborne contaminates. Astro-Pleat is also available in an Anti-Microbial filter media that inhibits the growth of micro-organisms including bacteria, fungi, and mold spores.